One in eight incidences of violent crime in Scotland over a one-year-period involved a single punch, it has been revealed. The statistic for 2015-2016 has been released by Police Scotland as it launches its "One Punch Can Ruin Two Lives" campaign. The four-week campaign urges people to think about the long-term consequences of their actions. It also asks people to consider that alcohol is often a factor. Assistant Chief Constable Mark Williams said: "Drinking too much can make you vulnerable and it increases your risk of becoming a victim of crime or getting into trouble. "One punch can kill and could result in you facing a jail sentence. "I want people to enjoy their nights out but at the same time to drink responsibly and consider how much alcohol they are consuming and the effect it has on their decision-making and judgement." Police Scotland will work closely with partners including the NHS and licensed premises to urge people to consider the consequences and change their behaviour. Posters and advertising will be displayed in bars and clubs, at ATMs and other public locations. Justice Secretary Michael Matheson said: "Identifying and tackling the root causes of crime and the issues that cause harm in our communities is a responsibility for the police, our partners and communities. "The 'One Punch' campaign is part of the Safe Summer - Action Against Violence campaign and I am encouraged by this initiative to reduce the number of violent incidents and improve the safety and wellbeing of individuals and communities." Dr Christine Goodall, director of Medics Against Violence, said: "One punch can be enough to take a life or to result in permanent and life-changing disability. This not only affects the victim and their family but leaves the perpetrator facing a long prison sentence with their future and that of their family also significantly affected. There are no winners. "We would like to reinforce, to young people particularly, how easy it is to cause serious injury. We see this all too often in hospitals and even if the victims survive their lives can be very difficult and different going forward. "We would appeal to young people to make sensible choices about their actions and around alcohol and to groups of friends to look out for each other when out socialising, because impulsive action taken when judgement is clouded can result in a lifetime of regret." Donald MacLeod, chairman of the National Licensed Trade Partnership (NLTP), said: "The NLTP fully supports any rational, targeted campaign, including this one, which promotes responsible drinking of alcohol and highlights the dangers, damage and suffering that can occur when someone has one drink too many and throws 'one punch'." Alison Douglas, chief executive of Alcohol Focus Scotland, said: "With more than half of violent crime in Scotland linked to alcohol, this campaign delivers a really important message. Binge drinking can cause people to lose self-control and situations can quickly escalate with devastating consequences. "While everyone is responsible for their own actions, there's no doubt cheap, highly-visible and easily-accessible alcohol encourages us to drink too much. Measures to reduce our overall alcohol consumption will reduce crime, make our communities safer and ease the burden on the police and emergency services." The campaign is supported by the charity Every Action Has Consequences which was launched by the family of Adam Rogers, who was killed as a result of one punch in 2009. Having lost Adam, his family and friends through the charity urge people to think about the consequences of their actions. Pat Rogers, Adam's mother and co-founder of the charity, said: "We are really pleased to see the 'One Punch Can Ruin Two Lives' Campaign being launched in Glasgow this week. "We are so glad that Adam's story is being used and we hope it continues to have a powerful impact on those who see it. 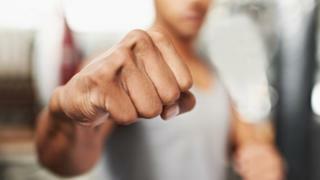 "Many people don't realise that fists can be as dangerous as a knife or a gun. One punch killed our lovely son when he was trying to act as a peacemaker. We fully support this campaign. It is so important to get the message across loud and clear - one punch is too many."